Encyclopaedia Britannica expands its successful brand licensing partnership with Publications International with the launch of Britannica Virtual Reality Exploration this Holiday season. 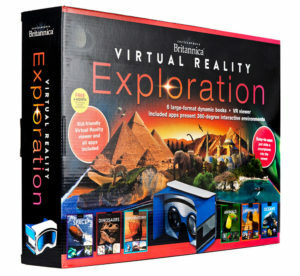 The is a 6-book set filled with information from Encyclopaedia Britannica plus a virtual reality experience. Each hardcover book is rich with full-color illustrations and photographs, lively graphics, inviting text, and videos. It is the perfect holiday gift that grandparents, parents, and children can enjoy together for hours! Included is a 6-month free subscription to Encyclopaedia Britannica Online. The set comes packaged with a virtual reality viewer and instructions for downloading six different apps for no additional cost.